Sometimes things defy all classification. They don't fit into any preconceived notions, mental compartments, or lend themselves to comparison. The brothers Schwarz, Ali and Basti, hailing from Stuttgart, Germany and known worldwide as the duo Tiefschwarz, make the kind of organic techno/electro house that is not easy to classify. Or, in this case, to review. So, i grabbed my iPod and decided to take their new Fabric 29 Compilation with me to the Museum of Modern Art in New York City to enlist the help of an art form that to this day denies all classification, the early 20th Century DADA movement. The DADA movement was, in many ways, a reaction to the carnage of WWI, a time when leaders around the world brought us to the brink of annihilation. This reaction was centered in New York and Berlin and like most artistic movements found its way to Paris. It consisted of disenfranchised artists more or less blowing up the traditional and accepted meaning of art. They basically asked the question, what is art? And decided that it could be anything given the proper application of creativity and vision. Everything from engine schematics, to readymade home items, to collages from old paper clippings, to the juxtaposition of words to incongruent images, to the automation of people and fostering of surreal imagery into a growing academic and acerbic discipline; this is art redefined. Looking at the electronic music industry today, the boundaries are no less defined. There are many subsets, if you really want to talk all day, but eventually you'll end up with the genres of House, Techno, Trance, Drum N Bass, Breaks, Electro, and Minimal. Many DJ's and producers are labeled into a compartment and become marketed to that audience. Regardless of whether every time you see them, they play a very mixed bag or they themselves profess in interviews that they shouldn't be pigeonholed. 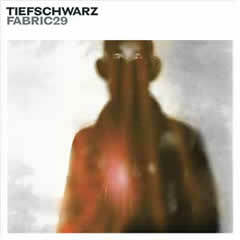 Here's where we get back to reviewing Fabric cd's; Tiefschwarz shows the world on this mix that they are not straddling a fence, they are not playing genre cards and doing the math, they are inventing a space (like the DADAists) where the genres don't make sense. Many artists attempt this with varying results, but this mix is a real example of how organic house can sound/flow into and incorporate the elements of electro and minimal and use techno stabs and trancey synths along the way. Troy Pierce's tripped out vocal as Louderbach on the opening cut Grace (Anxiety) let's you know immediately this is no ordinary mix. This mix is hard to classify, but it sounds wild as you navigate from being on edge to a more spooky place where the musical textures are rich and dark throughout, and the warm synths and myriad of bleeps are often contrapuntal to the rumbling basslines. Ben then this classification gets flipped later in this mix though when the dark undertones of bells and machine gunfire hi-hats charge at you on the incredibly trippy 'Hey You by Ichundu or the mix almost stops during the freaky house of the Jamie Jones track 'Amazon'. If this seems paradoxically, it is. But here's the real paradox: it works. From here, you'd expect the mix to start driving with the drums, but you'd be wrong. Tiefschwarz steers us instead with the melodies, seemingly mixing tracks that only make sense when spliced together. Later on, the rhythms mostly take a backseat to the melody and minimal (read: sparse) sounds pave the way. Many compilations work the listener into a frenzy of explosion then release, but Fabric 29 just kind of washes through you. I've never professed to be a lover of minimal or electro, i like both. But the way these guys weave minimal and electro sounds up, down, and around their dark brand of house is not only impressive, but invigorating. Riton's 'The Hammer of Thor' and Claude Von Stroke's 'Who's Afraid of Detroit' as employed in this mix would fit well into this exhibit, if it only had a soundtrack. In the end, I'm still not entirely sure where to classify Tiefschwarz' 1st foray into Fabric, much like the DADA movement turned the art world on its head, this mix has that dizzying effect. Maybe Tiefschwarz Fabric 29 will have the same appreciative value.